This system was chosen for the Mt. Everest Cleanup project in 1998; financed by Nike and Microsoft. Eco-Safe uses a 5-1/2 gallon rotomolded plastic tank that fits inside a military surplus rocket box. 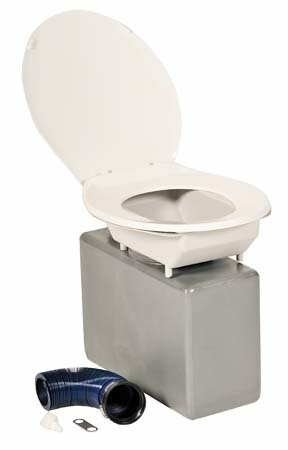 Its toilet seat fits securely on top of the rocket box, and a plastic seat flange funnels waste directly into the tank. Tank is 17-1/4" x 7-1/4" x 13-3/8", has a 3" cleanout fitting, water hose connector with a pressure release fitting, and a threaded plug over the user opening. Rounded corners make it easy to clean. System includes one tank (good for 50 uses), seat, cleanout hose, and 1-gallon plastic container with lid to hold the hose. Spare tanks(item #1580-TK) provide extra capacity. You need at least one rocket box for the in-use tank; additional boxes serve as secure carrying containers for extra tanks. Rocket boxes are sold seperately-item#0514. Eco-Safe System is 11. 5 lbs. If you have any questions about this product by GTS, contact us by completing and submitting the form below. If you are looking for a specif part number, please include it with your message.